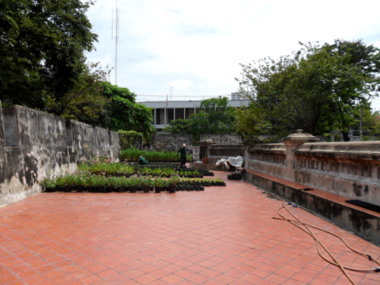 Fort Pong Patchamit is an Bangkok fort built in 1852 in Khlong San on the west bank of the Chao Phraya River. Only a small section of the walls remains today. The rest of the fort was demolished over the years. 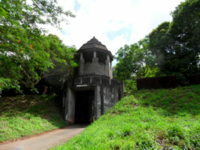 In 1949 the Fine Arts Department registered Fort Patchamit as a national monument to protect it from further destruction. 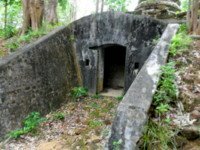 In October 2007, a surprising discovery added a new twist to the history of this old fort. 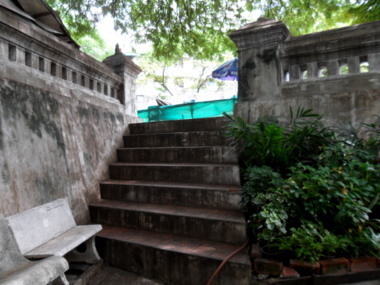 Located in Khlong San district on the other side Chao Phraya River the fort is completely off the tourist track. It’s so obscure that you’ll need to look hard to find it. The name of the fort is spelt as Pong Pajjamitr in some documents. This is the direct transliteration of the Thai letters to English but it’s going to be a tongue twister for non-Thai speakers. 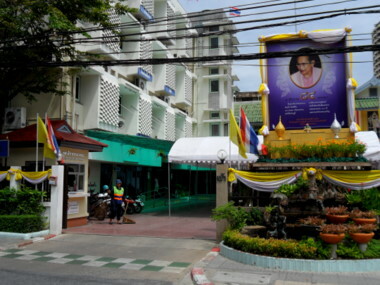 The tourist information board near the fort spells the name as Pong Patchamit which is closer to the way the name is pronounced. 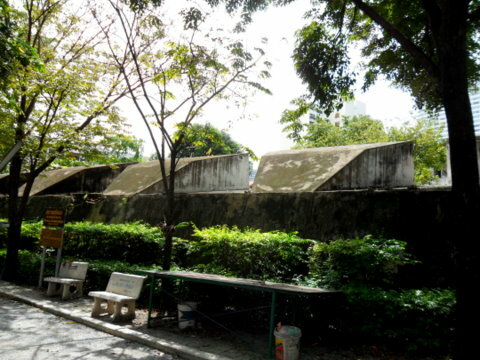 The fort is located in Soi Lat Ya 21 just behind the Khlong San district office. There’s an apartment block just next to the fort, likely to be the homes of the district officials and their families. Go past the gate and walk along the lane till you see the walls of the fort on your left lined with hedges. There’s a small park behind. To get into the fort you’ll need to go through the main gate of the district office, inform the security you are visiting the fort, and walk through the buildings to a flight of steps. The space up on the ramparts has been converted to a little nursery. Access to the fort can also through the main gate of the apartment block just next to the fort. Please ask the residents for permission first. This old fort was built in 1852 in the reign of King Rama IV (1851 – 1868) one of eight forts to be built on the west bank of the Chao Phraya opposite Bangkok as a defence against any naval threat along Chao Phraya River. Three years later the Bowring Treaty was signed which opened up Thailand to foreign trade. In the next decade, the steam ship replaced the sailing ship and foreign shipping to Bangkok rose sharply. 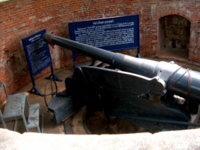 In the reign of King V (1868 – 1910), the fort was taken over by the Harbour Department to track the movement of visiting ships. It was the custom then to hoist flags to indicate the owners of the trading vessels that were arriving or departing from Bangkok. 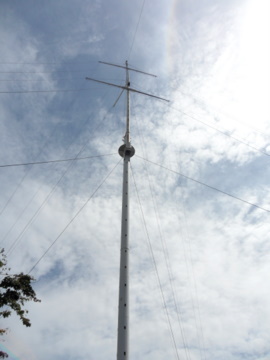 That flag pole was originally located within the walls of the fort. 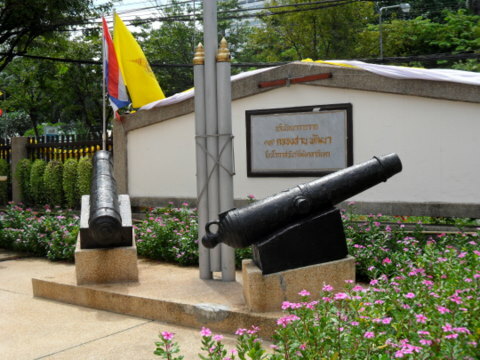 In the reign of King Rama VI (1910 – 1925), the flag post was moved to its current location about 50 m away of the old fort (at the junction of Lat Ya Road and Soi Lat Ya 21). Unfortunately seven of the eight forts were completely destroyed to make way for new construction. 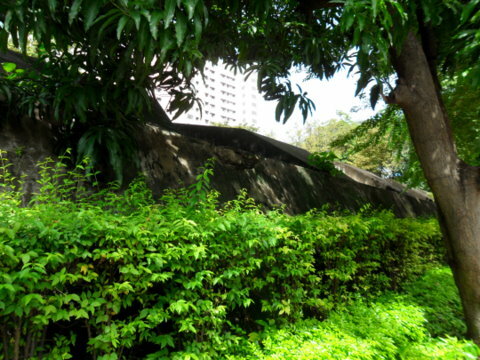 (Of the 14 forts on the Bangkok side only two remain.) At least 80% of Fort Pong Patchamit was destroyed too. The local authorities even wanted to destroy the remaining wall until the Fine Arts Department stepped in. 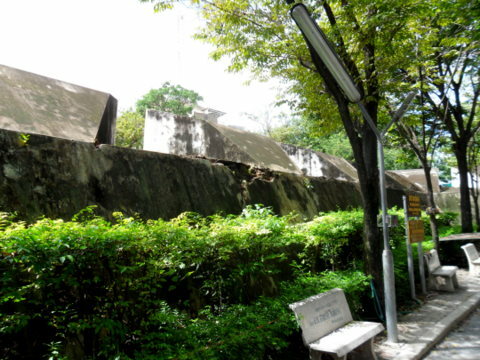 In 1949, the remaining sections of wall were registered as an national monument. 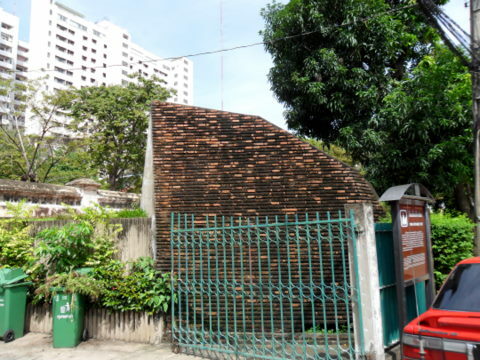 For the next 58 years, the old fort stood in one corner of Khlong San at the end of Lat Ya Road, a forgotten monument, until October 2007, when it hit the news. 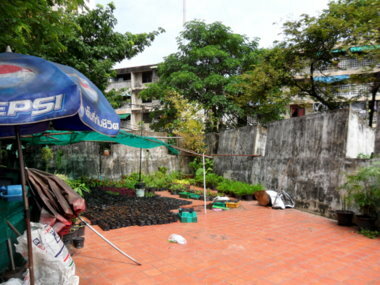 The plot of land adjacent to Fort Pong Patchamit was assigned to be the site of the new Khlong San district office. When construction workers excavated the site to lay the foundation, they had a surprise. They found 90 old teak logs; old clay pots, some pestles and a cannon barrel buried 2m below the ground. These are believed to remains of the old fort that was destroyed years ago. It is unclear what happened to the old relics. Whatever the case, construction continued and the new Khlong San district office is now completed. The cannon are on display in front of the completed district office. So if you like old forts, take a trip across the river and drop in at Fort Pong Patchamit. An old place like this deserves some attention. Take a Chao Phraya River boat from the Sathorn pier to N3 Si Phraya pier. Walk out of the boat pier past the Royal Orchid Sheraton and go to the ferry pier on the other side of the hotel. Take a ferry to cross over to the Khlong San market that’s just next to the Millennium Hilton. Walk through the market to the main road, Charoen Nakhon Road and turn right. At the next junction, turn right again into Lat Ya Road. If you wish to go inside the fort, you’ll need to go through the district office which is only open during office hours. Viewing the fort from the outside can be done anytime. Admission is free. These are some of the hotels nearby; about 5 minutes ride by taxi and in some cases within walking distance.